The US Secretary of Agriculture chose Oregon this week to roll out details of a new conservation program funded by the latest Farm Bill, praising the state for how it values farmers, ranchers, and other landowners as well as natural resources. In a one-day visit to Portland and Salem, Secretary Tom Vilsack touched on several other issues important to Oregon including sage grouse, wildfires, and food innovation. While in Portland, Vilsack announced the launch of the Regional Conservation Partnership Program (RCPP), authorized by the 2014 Farm Bill and expected to provide $1.2 billion in funding over the next five years. RCPP streamlines conservation efforts by combining four existing programs into one. Oregon will have an excellent opportunity to receive conservation funding through a competitive process with project proposals from other states– especially since the Columbia River Basin has been designated as one of eight critical conservation areas in line to receive 35 percent of RCPP funding. What’s different about this program is the expansion of partnerships to help agricultural producers and landowners improve conservation efforts. Combined with investments from participating partners, USDA expects its $1.2 billion in funding over the next five years to leverage another $2.4 billion for conservation. RCPP will competitively award funds for conservation projects that are designed by local partners and specific to the region. How much will end up in Oregon is anyone’s guess, but Vilsack expects a lot of great ideas and applications to come forth, making the final decision on who receives additional conservation funding a challenge. Awards made for 2014-15, an anticipated $400 million, are expected to be announced in October. 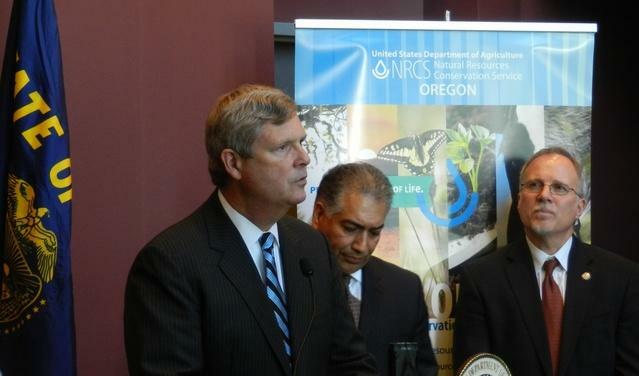 Since being named agriculture secretary in 2009, Vilsack says USDA has entered into more than 3,600 contracts with Oregon producers and landowners for conservation purposes with a total investment of about $195 million into the Oregon economy. That doesn’t count state efforts, including an average of up to $40 million a year for grants issued by the Oregon Watershed Enhancement Board (OWEB). 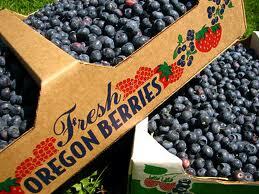 Oregon Department of Agriculture Director Katy Coba is also excited about the RCPP program. Secretary Vilsack also announced an additional $434,000 from USDA to provide technical assistance for conservation efforts undertaken by producers and landowners dealing with the potential federal listing of the sage grouse, a major concern east of the Cascades. Vilsack has encouraged the US Department of Interior to provide regulatory certainty for landowners who make investments to protect habitat that they will not face additional requirements if and when the sage grouse is listed as an endangered species. Vilsack also sympathized with Oregon and other states facing forest and range fires this summer. He supports proposed legislation that creates a new system for fighting fires and paying for that effort. While in Portland, Secretary Vilsack toured the Food Innovation Center (FIC)– a joint ODA-Oregon State University facility that provides assistance with food product development, among other features. “It’s taking Oregon products, processing them, encouraging more unique and branded opportunities for small businesses to get started, and then expanding the ability to sell those products locally, nationally, and internationally,” said Vilsack. The secretary participated in a routine activity at the FIC– product taste testing– with mixed reviews. Vilsack also praised Oregon’s leadership in establishing an effective FoodCorps Program, the first ever national deployment of service members specifically working on farm to school and school garden activities. For more information, contact Bruce Pokarney at (503) 986-4559.